Happy Monday, sleepers! We’re kicking off the week with a fabulous mattress giveaway. Up for grabs is the ever-so-cozy hybrid mattress from Eve! Scroll down and enter now so you can dream of winning a better night’s sleep all week long! 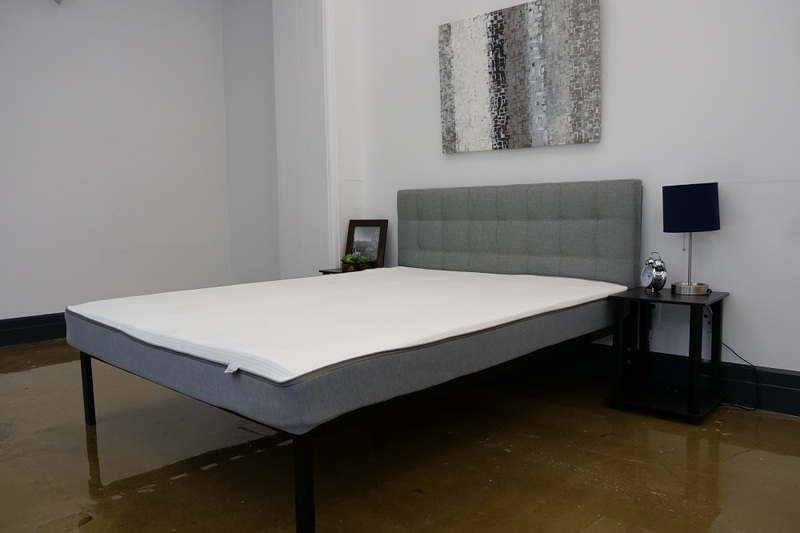 There’s no denying the unparalleled comfort that a new mattress brings, but the Eve hybrid mattress might be especially beloved by combo sleepers. It’s design is made of buoyantly soft foam, high-density poly foam, and a pocketed coil system. This way, you can comfortably roll around atop a bouncy-soft without losing any support. So what do you say? Ready to test your luck for a chance at this dreamy hybrid mattress? Go on and throw your hat in the ring — and in the meantime, read our full written review of the Eve Hybrid Mattress to get extra excited! Good luck, sleepers! This is definitely something I need! This mattress looks very comfortable. Very comprehensive review. The hard decision is now, do I go for a hybrid or a fully foam mattress. I guess I will just have to sleep on it! This mattress looks so comfortable! I think it looks wonderful and comfy. Wouls get the perfect nights sleep with it. The Eve Hybrid looks exceptionally comfortable. What I’d do for a perfect night sleep on this mattress. Thanks Sleepopolis for your in depth review. The number one site to come for trustworthy reviews when shopping for a mattress. The Hybrid mattress looks really comfortable and sleek. Looks like I could get a good nights sleep on it. It looks amazing and sounds so good….Perfect for insomniacs like me to finally get a decent night’s sleep! This Sound like a Mattress I Would Love As I Have Chronic Neuropathy and I am in Constant Pain all night I Need Comfort even if I do not Sleep & It Would Be Nice To Have my Carer Husband Back in my Bed after Years on the Sofa As My Fidgeting Kept him awake , But With This Mattress He Would not Feel my movement Very Much . My Thyroid & Brain Disease Cause My Body To Over Heat ,your Mattress would Be Ideal To Keep me at a Decent Temperature . I Would Love to Test This Please . It looks amazing! I must admit my back is struggling with my current mattress so this would be just brilliant. It looks really comfortable and durable. I don’t dream of being woken by a Prince and a kiss. I want to fall asleep and slumber timelessly on one of your mattresses. Great review and it looks very comfy. Would love to give this a go to see if it would stop me getting back ache! I think this Eve Mattress looks super comfy. I could have many a sweet dream in this Mattress. Fab prize, mattress looks amazing. Fantastic! I need a whole new bed and this mattress is a great start! This mattress really does sound so comfortable. Just what I need. omg im desperate for a new matress and this just looks and sounds perfect!!! Sounds amazing and I would love to give it a try! This would be wonderful. I love sleep and a perfect bed would make even more amazing. Sounds perfect, I’d love to try this. I suffer from sleepless nights, so this looks heavenly for a good nights sleep. We’ve been toying with the idea of buying one of these and the more i read about them, the more I want one! Sounds perfect after watching the review. Our current mattress is causing us agony and lack of sleep. This mattress sounds absolutely amazing. I suffer with a number of medical conditions that make sleeping and getting comfortable in bed extremely difficult, so I would love to see if these mattresses do live up to expectations and reviews. Looks very comfortable and modern. It’s a tricky decision picking a mattress! sounds amazing would love to be able to try it out. Does anyone know if this is good for keeping temperature down so you don’t overheat ?